The long-awaited, breathlessly anticipated final book in Veronica Rossi’s Under the Never Sky trilogy is finally here, but is it everything I’d hoped for? Not really. Rarely does a middle book end up being the strongest of a trilogy, but it’s been known to happen now and then, and it happened here. Through the Ever Night set the bar extremely high for this conclusion, and while Into the Still Blue reached significant heights, it stayed well below its predecessor. The struggles and losses continue in this book – some more painful than others – but none have the impact of the loss we faced in Through the Ever Night. Looking back at the whole picture, I’ve come to realize that the intensity present in the first two books, the gripping fear and uncertainty of survival simply weren’t there now. If anything, Into the Still Blue was somewhat predictable, and while there were lives lost, I saw every death coming from a mile away. How strange that I didn’t find Perry and Aria’s relationship convincing at all in this book! Perry held back too much, they each had their struggles and secrets and things they just didn’t discuss, and even when that changed, the closeness I’ve hoped for, the intimacy I’ve come to expect, was gone. It pains me to admit this, but there was something missing between them and as a couple, they lost at least some of their shine. That’s not to say that I didn’t appreciate the daring route Rossi took with Aria and Perry. They remain a favorite in so many things, most of all the complete lack of drama and/or love triangles between them. But while I liked the idea, the execution was somewhat lacking, and their previous chemistry was virtually non-existent. Strangely enough, Aria and Roar’s friendship continued being the highlight of the series. That’s where I found the closeness I wanted to see in other relationships as well. While it was never more than a pure, honest friendship, I still felt more intimacy between them then I did between Perry and Aria. Aria found a perfect friend in Roar and he found the same in her. However, by far the most interesting and emotionally intense part of this book was Perry’s friendship with Roar. The pain, the guilt, the resentment, it all came crashing down on them both and they were tested unlike ever before. 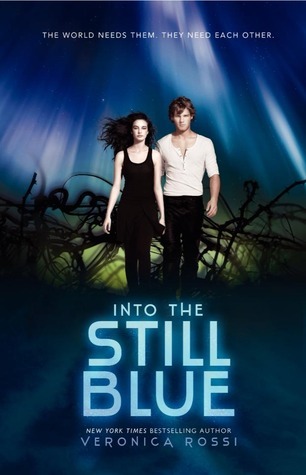 Into the Still Blue would have benefited from a longer epilogue, a chance for fans to calmly say goodbye and close a book with a satisfied sigh. After all the pain and suffering we (and the characters) were put through, after all the tears for lives lost, I felt that we deserved something more, akin to what Melina Marchetta gave us in Quintana of Charyn or similar to what Ann Aguirre did with Horde. Here, the ending felt rushed and entirely insufficient, so here’s to hoping for another novella to make things right. Despite feeling a bit underwhelmed by this conclusion, I’d never hesitate to recommend the trilogy to anyone who would listen. The quality of Rossi’s writing makes up for most things that went wrong, and these characters will certainly stay with me for a long time to come. I have not heard of this series, so thanks for bringing it to my attention! I am going to have to stop coming by your blog, because I just keep adding more and more to my list of "to read" books. hehe! Kidding! I love reading your reviews! Thanks! A rushed ending with too short an epilogue? that makes me sad. Darn, I just read the prequel and loved it, now I am rethinking starting this soon. I know I will eventually but I don't want to be sucked in and then disappointed with the ending either. Too bad you were a bit underwhelmed by the conclusion. I still need to start this series. I agree, Maja. I so wanted a better ending, or a longer one at least. It was like BANG BANG BANG the end. Damn, I'm so excited for this one! I cannot wait till I get to read it. If the ending is a bit too rushed I guess I'll have to join you in hoping for a novella to settle things better. I really enjoyed the first book in the series, haven't read the second but have the third. ?? I'm thinking I do need to read the second before this final one, just so I can feel the warm fuzzies since it sounds like some of the chemistry is gone between the two MCs. Disappointing when a conclusion isn't all you want it to be! I agree with a lot of what you have to say. In this book the plot lagged. It was predictable and well... there wasn't a lot of it. Fortunately the relationships made up for what was lacking. I actually enjoyed Perry and Aria's relationship because it seemed that they finally kind of opened up and let go of their insecurities. Looking at the series as a whole. The strongest point of the series it seems is the wonderful relationships that have been developed. The plot isn't exactly special, the world building isn't out of the world. The relationships are. They are incredibly unique and I really wish more authors would develop such wonderful platonic relationships between a guy and a girl instead of morphing it into a love triangle monster. Aww, sorry the ending was too anti-climatic for you, Maja. I really enjoy these characters and hope I won't get disappointed with this one. It's always sad to see a series that you enjoy end in a half-hearted attempt. I'm sorry the ending was a bit of a letdown for you, Maja -- but I'm so happy to hear you'd still recommend the trilogy. This is the first time I'm hearing anything other than praise for this book, but I look forward to reading it and hopefully won't come away too disappointed. Thank you for sharing your thoughts! Hm... now I don't know... I'm an ending girl and I have to say that usually if a book is to disappoint me, it will be the final book. Still, I do like what you have to say about her writing and perhaps I will be "okay" with the final book because I know what to expect. I skimmed your review. I still haven't read the previous book. Strangely enough, I didn't LOVE the first book but I found it grew on me. The more I thought about it, the more I liked it. So hopefully I like the rest of the series. I wholeheartedly agree that Roar and Aria's friendship is more interesting that Perry and Aria, and I've felt that way throughout most of book two as well. I'm not sure Perry and Aria's romance has ever matched up to the way I felt about them in book one. It is so hard to say goodbye to this series, and even harder when it doesn't end in a more satisfying way. I'm sorry this wasn't the ending you'd hoped for, but I love your review! you know I didn't know it was a trilogy so I'm surprised but it's nice too. I'm sorry the relationship wasn't that convincing, it's problematic in a book like that. I should try the series to see how it is! It sounds nice. Personally I liked this book more than the previous 2 but I agree about Perry and Aria's relationship. The friendship with Roar did feel more intimate, even more so than Roar and Liv's in their novella.